The Elite Dangerous crowdfunding game is still currently under development and in its bets stage of creation, but one industrious gamer, Markus Boesen, has created his very own Elite Dangerous cockpit to play the game using 3 x BenQ TH681 Full HD 3D DLP televisions and a Crossfire 2 x Sapphire RADEON R9 290 Tri-X OC graphics cards. Together with a variety of other hardware components including voice recognition software, a Saitek X52 Pro joystick together with a Logitech G19 keyboard and a Logitech Z-5500 Digital surround sound system. Check out the system in action in the 10 minute video after the jump. 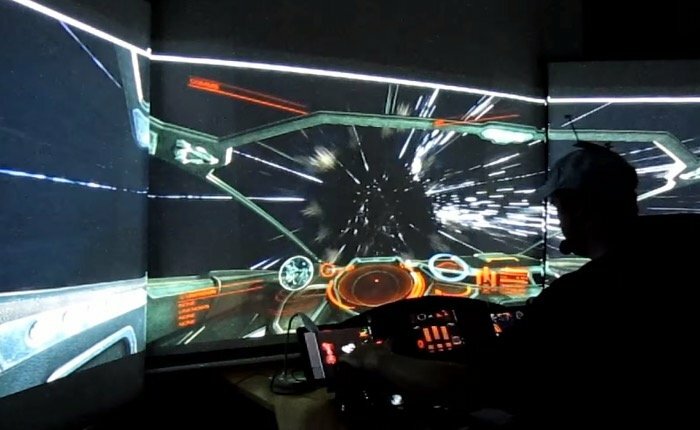 The hugely impressive gaming Elite Dangerous cockpit rig cost Markus Boesen just shy of £3,000, a price that does not even include the PC that is powering the setup. “Elite: Dangerous is the spectacular new sequel in the Elite series of games. Head for the stars, take a ship and trade, bounty-hunt, pirate or assassinate your way across the galaxy in this massively multiplayer online space adventure. The Kickstarted Elite Dangerous game will be released for PC on December 17th 2014 with a Mac version to follow shortly afterwards. For more information on the new Elite Dangerous game jump over to the Elite Dangerous website for details and the ability to purchase.